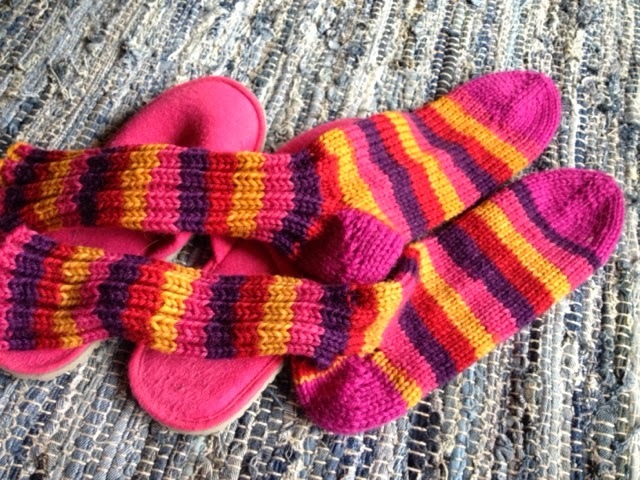 My friend needed a pair of thick socks, in bright colours so knit up these for her. The pattern is (like so many of my projects) a free pattern from Ravelry; "foot-ovens". Really fast and fun project, I hope the recipient is pleased too! The yarn is a self striping yarn from Hjertegarn. I did the toe and heel in a solid pink. Toe up socks are really quite neat to stitch, I just knit til I ran out of yarn!